I love connecting the dots and if there is one area where this OCD habit of mine comes in handy, it's Astrology and Tarot. 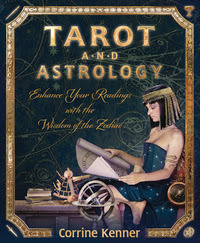 There are Major Arcana cards for each of the signs and planets (see here for details). So for example, my Sun in Aquarius is represented by the Star in tarot; a card about listening to divine guidance and trusting that everything will be OK.
My moon in Capricorn is represented by The Devil, an energy that makes you feel like you're chained to the material world, responsibility and work. The Sun sign represents your soul's essence and journey whereas the Moon Sign represents your emotional reactions or programming; how you're wired to react. 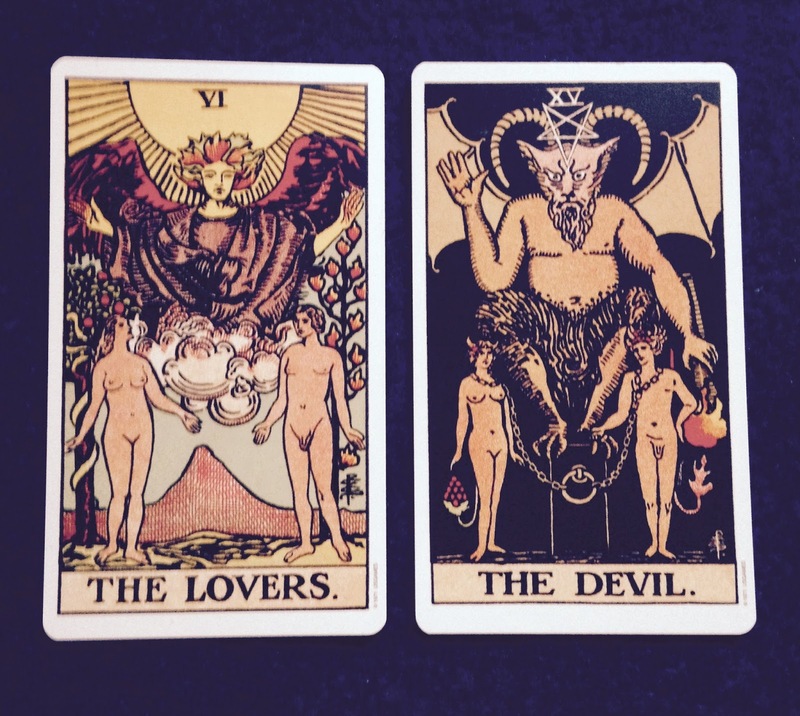 I have always felt a certain repulsion to The Devil, but I have no problem with the Star card. I actually bought a book called Tarot & Astrology by Corrine Kenner because the cover image grabbed my attention, only to discover that it corresponded to the Star card in her Wizards Tarot deck. The book is fantastic and even though it may take a while for all of the information to sink in, it will add depth to your readings. There's one more sign that is relevant in all of our birth charts: the Ascendant. This placement refers to how we interact with the world, our user interface. I'm a Gemini Rising, so that makes me chatty and quick to jump from one place to the next (a trait that came in handy during High School; I went to four schools in three countries). The Gemini card is said to be the Lovers, about making choices and listening to that inner voice even though if I'm honest, I don't see the connection. I mention this now because we explored birthdates in my Tarot class at The College of Psychic Studies (taught by the talented Avril Price), and would you believe these cards came up again! We each have a pair of Major Arcana cards that correspond to our date of birth. So for example, if you take January 18 1978, the digits add up up to Eight (1+1+9+1+9+7+8=8), which is the Justice card. My birthday adds up to Six: The Lovers. Avril then had us pair this image up with the other Major Arcana card that would have the pair add up to twenty-one (As an aside, there are twenty-two Major Arcana cards but the Fool begins the journey at Zero, and we count to twenty-one). 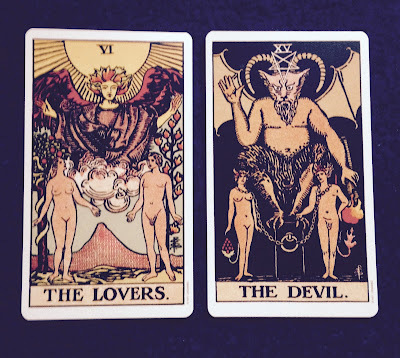 My birthday cards are The Lovers (6) and The Devil (15). The image is striking, like two sides of the same coin. So how does this relate to my life? Sometimes it feels like I'm torn between hope and fear, reaching for the stars or throwing in the towel. Ultimately the cards are about choices and the emotions or reasons on which we base those choices. Our tutor implied that this could be a significant incarnation for me. There are so many ways to interpret this combination. I wonder if it is choosing one or the other, or trying to listen to both and not getting lost in either of the cards. If I add my Aquarian Star Card back into the mix, it makes me feel a lot better. There is something about that Moon in Capricorn that still doesn't click. Maybe it's the anchor that brings me back to Earth (Capricorn is an earthy, work sign). I'm also taking a great Psychic Astrology class this term where we explore our charts intuitively every week. I'm up to my neck in stars and cards, lol, it's a lot of fun actually. Our tutor is Demian Allan, the only astrologer I've come across who teaches intuitively and theoretically (makes it easier when you're stepping into the signs). The Moon in Capricorn is my awkward point, something to look at. If I weren't going back to Mexico I'd sign up for Part 2. I swear it's better than going to a shrink, to the point and quite accurate.